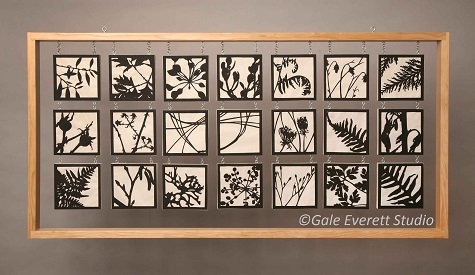 When I started creating silhouette images of native (and some invasive) plants, I had wanted them to hang in windows where backlighting could increase the design contrast. 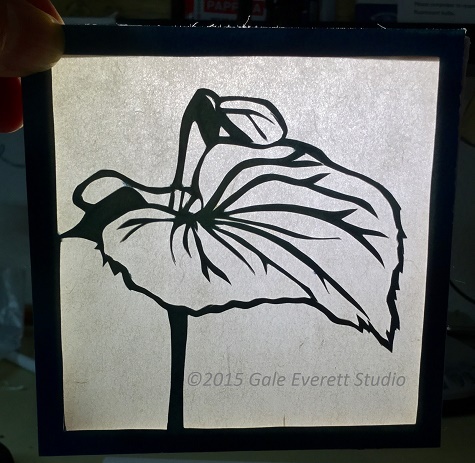 Fairly quickly I shifted to creating lamps using papercuts, but I’ve struggled achieving a really good bond between the translucent and thicker paper (not to mention how long it takes to cut and assemble one lamp). Plus they are fragile. The lamps have sold, but not as quickly as I had hoped. They remain on the back burner for now. 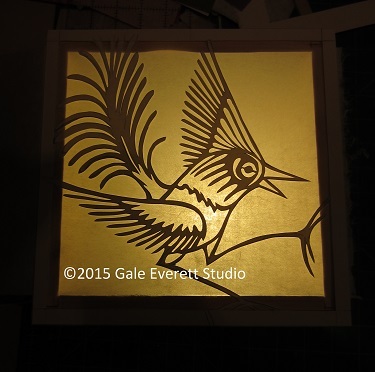 In January, I started playing with boxed birds. This was yet another take on the original idea but adding a fluorescent bulb into a wooden box frame. For now, this seems to satisfy what I’m wanting artistically, I just need to get better with my designs and increase my woodworking proficiency. It all feeds off one another and I keep circling back to the same general concepts. Below is an image of my first serious silhouette piece. It’s titled “A Walk in the Woods” and was created for the Art About Agriculture show through Oregon State University in 2011. That year’s theme incorporated the forests to the valley. I didn’t leave the forest. The boxed bird example from earlier this year. Eventually it will all come together in this new project. I promise! I’m reading my feed backwards, hence how my comments might be coming across. I love where you are going with this. I also love your blend of art and design, really beautiful work Gale!